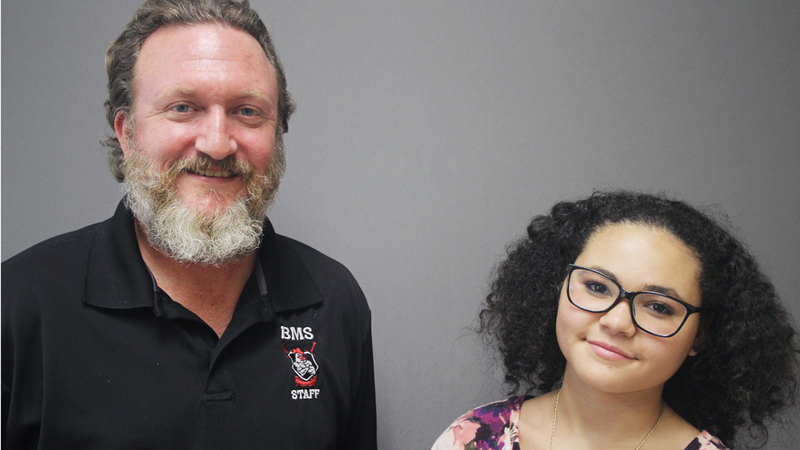 StoryCorps: Iraq Vet Offers A Final Lesson For His Former Student: 'Real Men Cry' Erik Booker now teaches middle school in South Carolina, but he also served in the Iraq War — just like the father of one of his former students, Jenna. She has a few important questions for him. Seventh-grade teacher Erik Booker and his former student Jenna Power, now an eighth-grader, visited StoryCorps recently. Erik Booker is a seventh-grade teacher in Sumter, S.C. 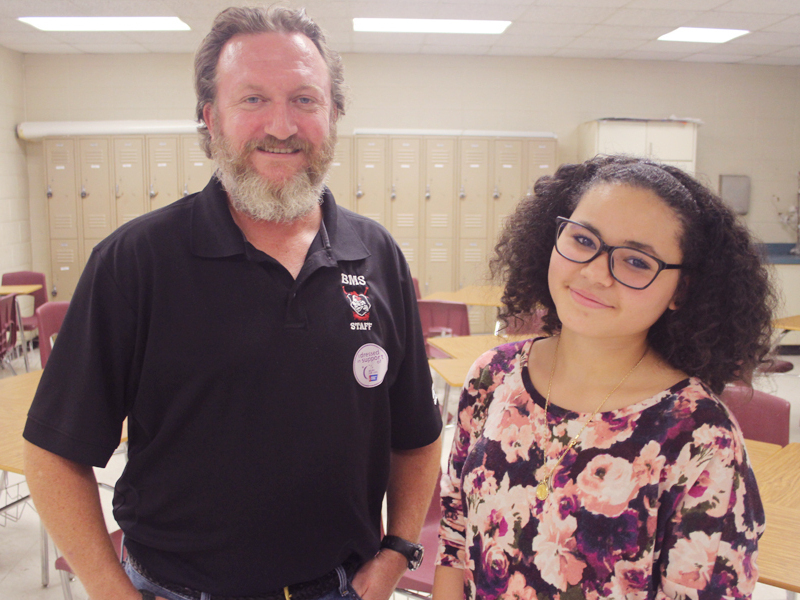 He also happens to be an Army veteran who served in Iraq — just like the father of one of his students last year, Jenna Power. 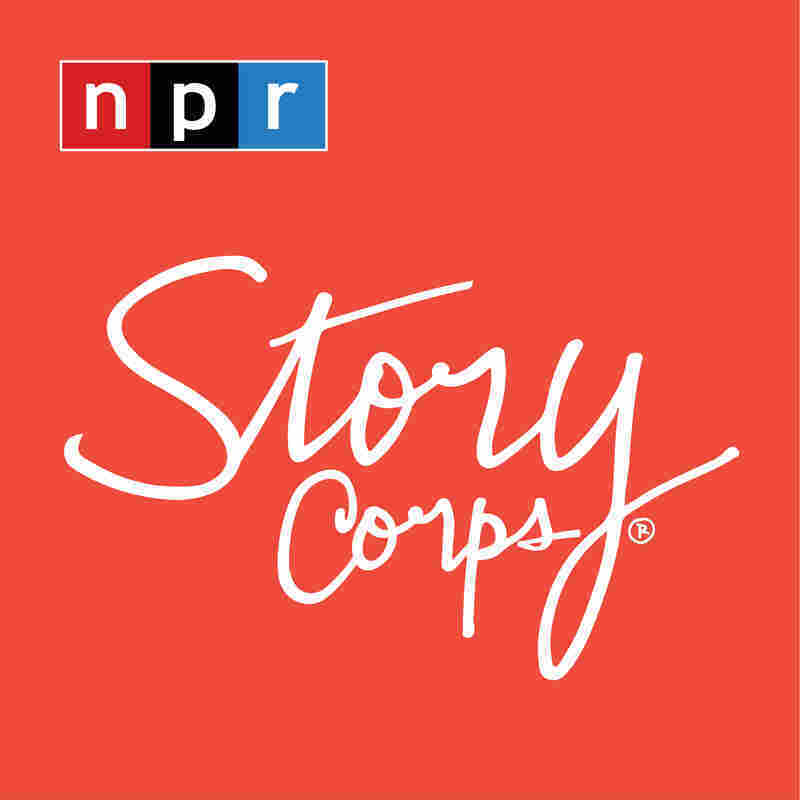 So, when Jenna and Erik visited with StoryCorps, Jenna wanted to know more about his experiences — including the most difficult thing he experienced there. "Being separated from my family for that long — you can't even begin to explain that to someone who hasn't experienced something like that," Erik answers. "Were you ever afraid when your dad was deployed?" "Oh yeah," Jenna says. "I was pretty young but I had nightmares about it. And when he missed my birthday, that just — it got me." As an intelligence officer in the Army, Erik was trained in reading body language and, he says, "understand[ing] when people are maybe not telling me the whole truth" — a skill he finds quite useful as a teacher, in a classroom full of middle-schoolers. As for why he decided to become a teacher? "Because I wanted to continue to serve," Erik says — but still, it was a difficult adjustment at first. "I remember walking into the first school dance with flashing lights, loud music, and I found myself flashing right back," he tells Jenna. "It was almost too much for me." Erik tried not to let on to his students that he was a veteran, purposely leaving that fact unmentioned. But Jenna says she could tell right away. Erik and Jenna, in the classroom. "My advice to you is be brave," Erik tells her. "My dad does things a certain way, and you had the same mannerisms and stuff like that — you know, even the way you walked," she says. "It was really weird." Erik recognized something in Jenna, too. He says she was never satisfied with his instructions, or the answers he would give the class. "You always said, 'But wait?' That was my favorite phrase from you: 'But wait?' I want you to ask those questions. Why is it that way? Why do we do things that way?" Erik says. "And to me that's what sets people apart, is that desire to know more — and you do that." "Well, you definitely made a difference in me," Jenna tells him. "So, thank you." "I am about to cry," he tells her. "That's OK. Real men cry." Audio produced for Morning Edition by Jud Esty-Kendall & Von Diaz.